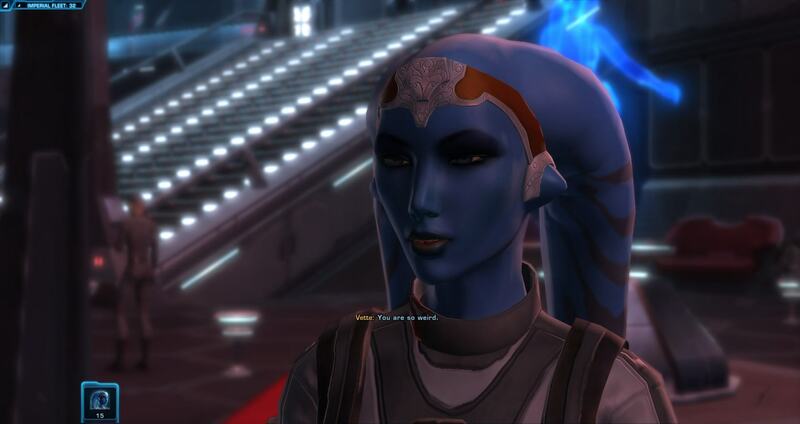 Yeah so I haven’t posted any SWTOR screenshots for a while. 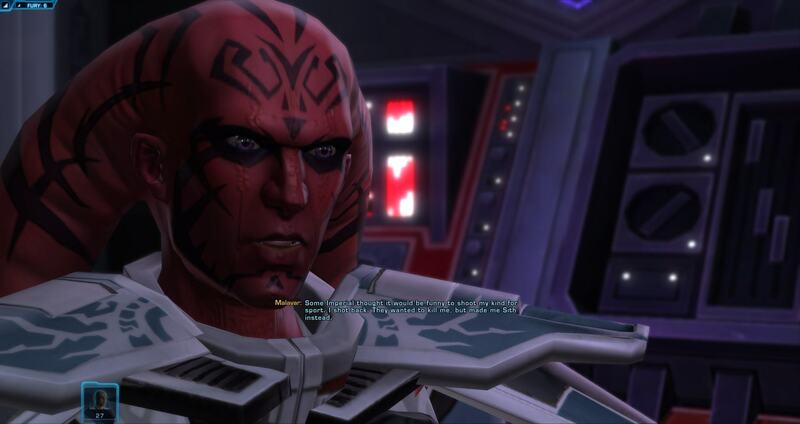 I’ve been playing Malavar, the Sith-y brother of Zamarra. I’m wanting him to get up high enough to get his cute Togruta companion 🙂 Plus, I’m really enjoying the stealth flavor of Sith Assasin. Most fights don’t give me much trouble. I say “most”, except for one notable exception: the boss for my Chapter 1 class quest. The quest forces me to bring along my useless tank companion who hasn’t got any gear. I can’t beat her. So, because of the way the game is set up, I can do absolutely nothing on that character until I do. I guess I could do space missions and PVP, but I can’t go quest anywhere. I guess I could go grind mobs until the next level, does that sound like fun? It’s a really crap design. 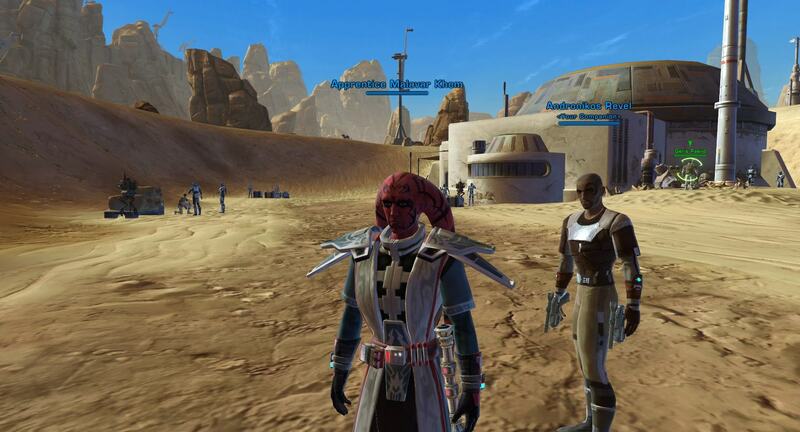 I’m waiting for Salty’s Sith character to get a few more levels so he can come along and help me. In the meantime, a few screenshots. I’m really bummed that my best one didn’t save. It was Malavar saying, “I’m not cute. I’m deadly.” Whatever you say, Malavar. I really like these shoulders. Yeah, somehow I don't think this will end well for you, Malavar. Getting to Ravenholdt proved to be more difficult than the Harrier had expected. No gryphons flew into Southshore anymore, thanks to the undead taking over. He had to rent a horse and ride through the hills — something he was neither accustomed to nor enthusiastic about. He was convinced that the animal had his death in mind as it chose the steepest cliffs to walk along, and tried to brush him off against tree trunks. Whoever said nightsabers were fierce mounts never had to ride a stubborn horse. He was all too happy to give the reins to the stablemaster at Ravenholdt, wincing as he dismounted. If he never rode a horse again it would be too soon. Blackbrew was already here, he was told, and he went inside to find the dwarf. His old friend hadn’t changed a bit. The Harrier clapped him heartily on the back as he sat down. The elf thought the chairs could be a bit more comfortable. “So did I,” he said, calling for his own mug. His ears laid back briefly. That’s why he’d wanted to change the subject. “Yes,” the Harrier muttered. “Stop it!” A few of the other patrons glanced over at their table. Blackbrew was still sniggering. The elf’s ears were still pressed backward. “So talk, dwarf,” he growled. The Harrier made a “go on” gesture. 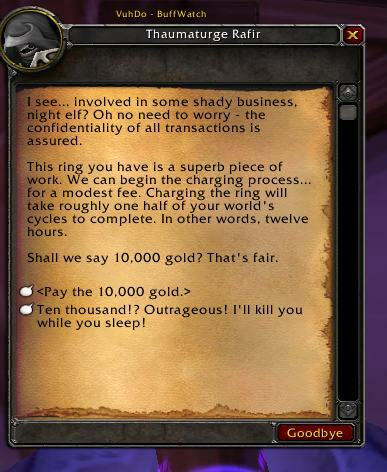 Going to Gilneas could be interesting. He wondered if there were any other people there that Rose might want to disappear. “It’s a dragon,” said the dwarf, leaning back in his chair to observe the elf’s reaction. From what he could see, they were exceptional blades. He wanted to get a better look, feel the balance of them, but the dwarf snapped the case shut and slid it back under the table. “From my employer,” Blackbrew explained, refilling his mug. Being stabbed had only been incidental. He hadn’t really noticed how much it hurt until Latahlali walked back to her room at the inn, and he stood up to go home. It was then that he finally resigned himself to visiting the healer and allowing someone to look at it. She frowned and washed it, and told him to be more careful — as if you could avoid being stabbed by a kaldorei hiding in the woods — and sent him on his way. Raleth agreed that it was a small price to pay for such a lovely evening, altogether. He’d tried to call on Latahlali at Andarthir’s house, early that evening. The old Highborne, looking more ragged and grouchy than usual, had informed him that she’d left. Gone. “Left? You let her leave?” Raleth echoed, aghast. Raleth had only been to Ashenvale once, when a unit of battlemages had been sent to assist the assault on Astranaar. He’d hated every moment of that trip, and had been all too eager to leave. But he still remembered how to open the portal there, and did so just out of town, where the war-camp had once stood. Correction: Where a war-camp now stood, as three orcs were now staring at him in slack-jawed surprise. He’d been prepared for this situation. The big orc had a broken tooth and an ugly scowl. “No one told us reinforcements were coming,” he grunted. Raleth twitched his ears and looked pointedly at one of the smaller ones. “I’m certain I sent a message. Perhaps one of your subordinates failed to deliver it?” The big orc scowled deeper, and shoved the one that Raleth spoke to with his boot. “Idiot! Should have told me!” he roared, and the smaller orc cowered in deference. Raleth still had a difficult time believing these stupid savages were capable of causing so much destruction. He steepled his fingers and waited patiently for the head orc’s storm to subside. For a moment, Raleth thought the orc might not fall for it, but then he unrolled the dirty map he held in his broad hands. “We go south at nightfall,” the orc leader said. “Meet up at Krom’gar Fortress.” The battlemage leaned over the map and stroked his chin thoughtfully. “An excellent move, sir. I will go and gather the others.” The orcs stared at him, their expressions lying somewhere between horror and awe, as he conjured the magical steed. The savage races simply hated it, and it made Raleth all the more determined to conjure it whenever possible. It was really a clever idea, one he wished he’d thought of himself. An enterprising mage in Dalaran had written the spell, and the copies sold swiftly. It was far more economical — and flashy — than an ordinary windrider or gryphon. He hoped the orcs believed him, urging the magical horse up over the tree-tops. It didn’t matter much now, he supposed, though they could come after him. But in their eyes, he was a member of their monstrous Horde, and would believe anything he said, so long as he said it was for that cause. Raleth watched the forest below, searching for a sign of a camp, for any clue where Latahlali might be. Andarthir had said their camp was on a small island in a river, so when he saw the glint of water, he steered the horse down onto a hill. It vanished with a shimmer of energy, and Raleth regarded the dark forest. He remembered the wolves and bears, but mostly the huge spiders. He thought it better to be safe, and formed an elemental out of the water from the river. Frost crackled over his form, forming a magical barrier against danger. 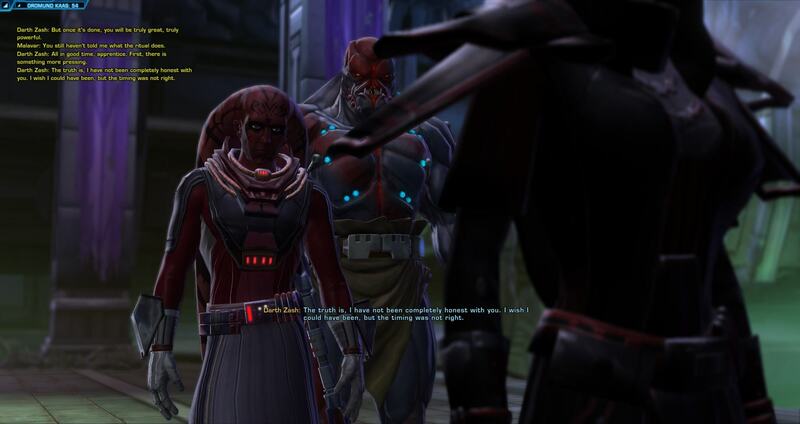 Raleth touched the hilt of Tahl’erdeth, safely at his side, and that reassured him too. He froze the river’s surface in a narrow path, and walked across to the island. It had been a camp at one time, but he couldn’t be sure if it was now. He made his way carefully, looking for anything that might point him in the right direction. The water elemental gurgled and moved off toward the center of the island. Raleth paused to watch it before he resumed his search. He frowned, pulling out the map he’d folded in his pocket, torn out of one of his books at home. The forest had changed since the Cataclysm, but he didn’t think it had changed that much. And that’s when he was stabbed. Thankfully, he was wearing his battle-robes, and the icy magical armor deterred the blade further, but it slid far enough into his back to make him howl with pain. Clutching at the wound, he sent the water elemental toward his attacker. A bolt of rushing water knocked the assailant off his feet, and the next bolt froze him in place. It was a night elf. The kaldorei blinked in surprise. “You speak Common?” Yes of course I speak Common, you idiot, Raleth thought, but he didn’t say that aloud. Not when he was still holding that knife. He explained that he was looking for someone, a girl who’d run away from Dalaran. She needed to return to her studies, and everyone was worried about her. That was true, though it was mostly Raleth who worried about her. Andarthir didn’t seem concerned about his apprentice at all. “You’re one of them,” said the kaldorei quietly, his expression darkening. “No!” Raleth protested. “No, I came from Dalaran, I told you. My allegiance is to the Kirin Tor, I have nothing to do with those filthy orcs.” He wasn’t sure if the kaldorei believed him or not. Raleth dismissed the water elemental with a wave of his hand, so as to appear less threatening. The kaldorei stood and rubbed at his chest where the bolt had hit him. “Have you seen her?” he asked again. “She has long blue hair.” Raleth looked at the bandage, which had become soaked with blood. He found another one and pressed it to the wound. “Oh, he’s still — wait, you know about him? So you do know her!” Was this Latahlali’s grandfather? It would make sense, if this was their camp. If so, where was she? “Magic,” said the kaldorei, and Raleth realized his mistake too late. He’d forgotten, for a moment, that race’s irrational fear of the arcane. He hoped he hadn’t just caused more trouble for Latahlali. “Come here,” he said, more loudly, and Raleth blinked as the girl came out from inside the hollow tree-stump behind them. He’d passed right by it and he hadn’t seen her, how did she do that? When she saw him, she smiled, he was certain of it. The older kaldorei’s scowl had deepened. “I did not send you to Dalaran to make reckless decisions,” he said to Latahlali, crossing his arms. “Sir, she wasn’t reckless. She was supervised at all times,” Raleth protested, but the old kaldorei’s look silenced him. Maybe it was better that he just remain quiet. She shrugged out of his grasp. “No,” she said quietly. The old kaldorei’s expression wavered ever so briefly. “Then do not return here,” he said, and he turned to wade across the river, disappearing into the surrounding forest. Latahlali watched him go, and then turned to look at Raleth. “Oh!” she gasped. “You’re hurt! Did he do that?” She went to look at the wound, and he didn’t stop her. “It’s nothing,” Raleth said. “He was just startled.” Surely he didn’t mean to try and kill me. Right? Latahlali wiped her eyes and looked at her arms, grimed with mud. “Could we go back?” she asked quietly. Raleth waited at the park while Latahlali went up to her room and changed. He hadn’t forced her to come back, he’d made that very clear. If she had wanted to stay in the forest, he would have left — reluctantly, yes, but he would have. He wanted to offer her the chance to study with him, but what if she refused? What if she didn’t want to study magic anymore at all? “Yes,” he said, and he meant it. “But I haven’t got anything right,” Latahlali sighed. She picked at the end of her braid. “Would you teach me?” she asked, and Raleth could hardly breathe. She didn’t laugh or scream or run away, so that was good. Latahlali said nothing, and that was less good. She was regarding him thoughtfully. “I shouldn’t kiss my instructor,” she said. “It’s improper.” Latahlali was picking at her braid again. “Everyone would talk.” He couldn’t understand why she’d say that. She certainly wanted to kiss her other instructor. Was it because his beard wasn’t big enough? “I don’t care,” Raleth said. Latahlali considered this for a while longer, and then she leaned in and kissed him. It wasn’t exactly as he’d imagined — the way he imagined, he was far less of a coward and had professed his feelings in a far more poetic way — but it was wonderful all the same. She rose from the bench. “I should get back,” she said. Raleth twitched his ears. “Was it that bad?” He hadn’t thought it was, but maybe she had. Maybe she wanted more beard. “No, it’s just that I didn’t get much sleep today. I’m very tired.” He hadn’t considered that. He nodded, and kissed her gently again before she turned to leave the park. On his way to the healer, he stopped at the flower cart and had a bunch of wildflowers sent to her room at the inn. He hoped when he woke that the wound would still be there, if only to prove tonight had really happened. It was a productive one! 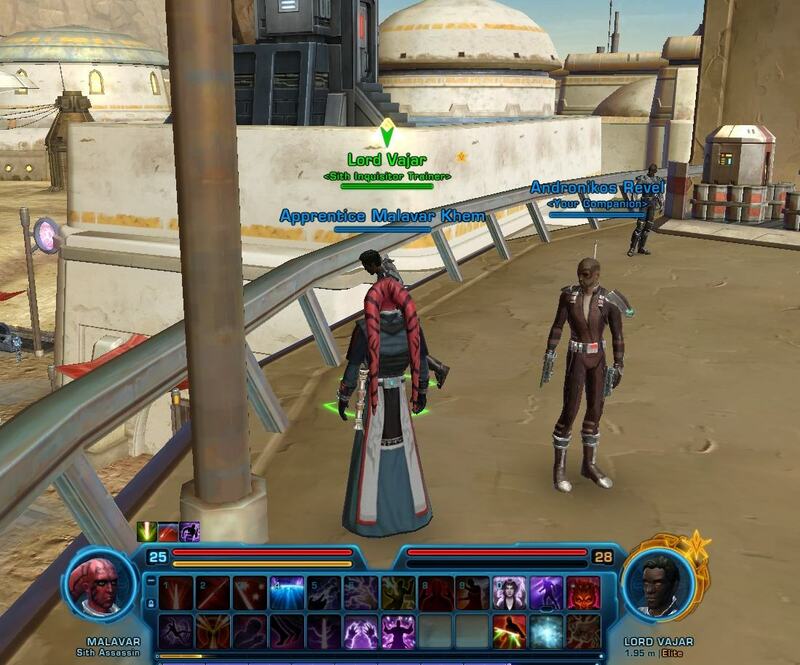 We got 2 raid achievements: Not an Ambi-Turner on Rhyolith, and Don’t Stand So Close to Me on Morchok. And of course, Ornasse got his Flamescythe! Harrier finished up the first (and only, for him) part of the dagger chain. Ornasse got his chest token and now has his 4-piece bonus. Still very very close to Exalted with Avengers, maybe we’ll be able to kill Ragnaros tonight! Today we were able to finish up the first step of the Rogue legendary, for the 397 daggers. This was such a fun chain, I really hope they put in more stuff like this for other classes. The Harrier went (OOCly) with Latahlali, though if you’ve been reading along in the Brambles storyline, he’ll actually be going with a dwarf named Blackbrew. Here’s a few pictures. I wanted to get some of the fight, but it was a bit too chaotic, and it ported us back right after. Andarthir’s stack of books sat unexploded on the table, where they would most likely stay. Latahlali had tried to leave last night too, and he’d finally convinced her to stay and continue her studies. But she got the idea into her head again, and this time he simply let her go. She wasn’t a prisoner, she could leave at any time she wanted. He was angry, but mostly disappointed that she would let all of her potential slip through her fingers like that. Let her go back to cowering in the forest and peeling potatoes. It was safer here, but she couldn’t see that. She could be Vaelarian’s problem again. The evening had started out pleasant enough. He’d met the sin’dorei woman in the Parlor, the one who had written to him about his teaching methods. She was polite and curious, and he explained as best he was able. But then things got strange. She started asking about Latahlali, whether he should allow her to wander in the city — why not? She was an adult, as she was fond of reminding him, and Dalaran was safe. Then the sin’dorei suggested that he take the girl to look at the dragons in the forest below. What folly! Though they were not as agitated as they once were, the blue dragons had not completely regained their senses, and were still a hazard — especially to apprentices. And the beard. She’d asked to touch it. Had some sort of madness affected all of the females in Dalaran? It was just a beard, like any other. Why were they so fixated upon it? Andarthir suspected that Latahlali had sent the woman to get information, and the idea irritated him. If she wanted to know something, she should have the decency to ask him herself. Latahlali was home before him, for once. She asked him what he wanted, and she didn’t like the answer. But he wasn’t about to lie. Maybe his answer would have been different before, but that was before. He had a responsibility now, not only to her but to Vaelarian. If she wanted to run away, to give up and quit, he couldn’t stop her. He sighed and went back to his reading. 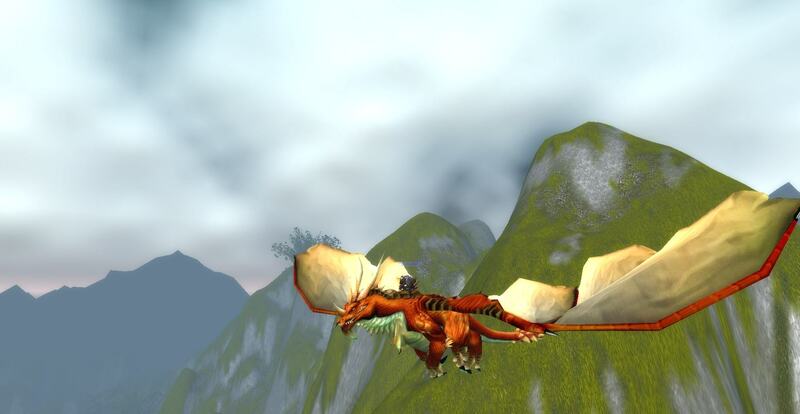 Admittedly, it was reckless to allow Vilwena to roam about Stormwind unattended, but Uldred could see no other option. He wasn’t about to get any work done with her constant pestering. Besides, the trouble she’d get into wouldn’t really hurt anyone. They might actually enjoy it. “And you can’t call me that,” Uldred sighed. “But you are,” the succubus pouted her lip out further. “Yes, but humans don’t call each other that. Call me by my name, or–” he paused, his brows furrowed. “Darling. Something like that.” That’s what Mother had called him. It was the first thing that came to mind, but he didn’t really want this demon using it. Vilwena stomped a foot — a foot, not a hoof, she was in her human disguise — and lingered at the doorway. “I want to stay here,” she whined. Uldred hurried her out. There was far too much work to be done. The list of names lay forgotten on the desk, for the time being. Those would be easy to track down, but later. Now he had to work on the translation of the book he’d found in the library. The Harrier hadn’t expected anyone to bother him down at the docks. Though they were bustling with activity, everyone was busy with their own business, and wouldn’t pay any mind to an elf sitting alone atop some crates. He was waiting for a shipment, but mostly he’d wanted a place to think. Foremost on his mind was the letter from Blackbrew. He was a bit wary, given the lack of details, but Blackbrew was right: they trusted each other. The Harrier had met the dwarf while he was living in Ironforge, the leader of a small band of keg runners and smugglers. He had to be one of the first elves that the dwarf had ever seen, and he thought it was uproariously funny when the Harrier had asked him for a job. As it turned out though, being extremely tall in Ironforge lent you a certain degree of gravitas, and the Harrier soon became Blackbrew’s chief enforcer. 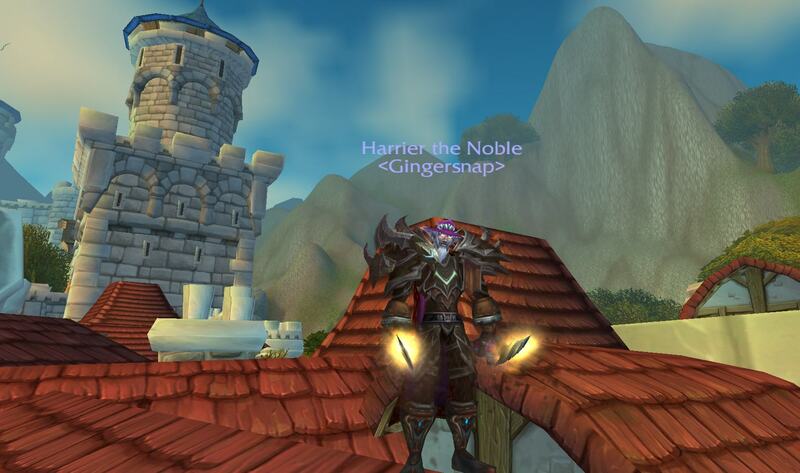 They expanded their business into Stormwind, and their infamy grew. There were more rivals in Stormwind too, and they sometimes got into scrapes. But Blackbrew never lost his head nor his sense of humor through it all, and he never cheated or backstabbed the Harrier though he had plenty of chances to do so. If the dwarf needed this job done, the Harrier would do it. Maybe they could catch up on a few drinks while they were there, too. Ravenholdt had surprisingly good drinks for a place in the middle of nowhere. Josie had showed up, first as a bird so he didn’t recognize her. She said she was just flying around the city, but he wasn’t sure he believed that story. But so what if she was following him? He was just sitting here, watching for the evening ship from Kalimdor. An elf woman approached them; riding her saber and dressed all in her Sentinel armor. She gave the Harrier a look, like he was a pile of fish guts that had been left out in the sun. He disliked her immediately. “Where is the ship to Northrend?” she asked, and he pointed down toward the end of the docks. 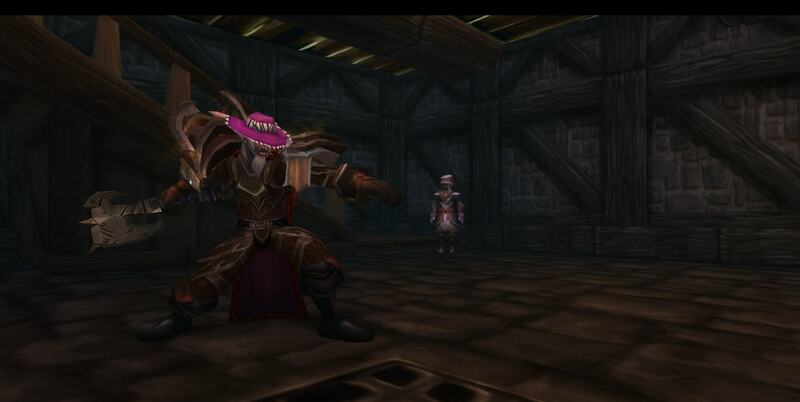 He didn’t know why anyone would go to Northrend, especially now. But if it got her to leave, all the better. Unfortunately, he didn’t think there were any more ships leaving tonight. He told her she’d have to get a room at the inn. Josie didn’t think it was funny when he suggested the elf stay at the Stag House. The elf woman kept watching Josie curiously. “Is she your pet?” she whispered in Darnassian. Sentinels were the worst, thinking they were better than everyone and hating anyone even slightly different. The Harrier laid his ears back. He explained that they worked together, for a Lady in the city. The sentinel looked skeptical. Josie was being polite to her, far more polite than she deserved. The Harrier went back to working on his animal. He wasn’t sure what it would be just yet; he thought perhaps a cat, but he wasn’t certain if Rose liked cats. She liked the horse, but he couldn’t do that again. Oh, she was leaving. Going to one of the inns for the night. She said her son gave her money, and Harrier was surprised at that. She didn’t look old enough to have grown children. “You weren’t very polite,” Josie said quietly, after the elf woman had left. The Harrier shrugged. “She wasn’t either.” He didn’t feel like explaining it to her. He thought Rose understood, as well as a human could anyway. But once was enough. Instead he told her that he’d be gone for a few days, for some business. “You’re coming back though, aren’t you?” Josie asked. Unless something terrible happens and I die. “Of course,” the Harrier said. “I don’t talk that much,” he protested. The Harrier nodded. “I always am.” He’d already made that promise to Rose. That one was certain not to break.